R.C. Sproul wrote this book (of only 94 pages) in 1983. My marks were in it from years ago but I didn’t recall reading it. As I read it I was satisfied again to be reading in the area of Christian ethics. 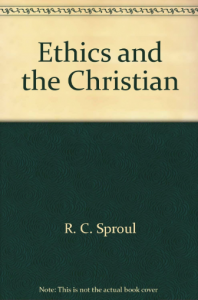 Sproul dealt with ethics and morals, legalism and antinomianism. In these areas he takes the usual direction of a middle road between what he considers extremes to the right and left. His thoughts on ethical continuums is a little unique and added some different thought to the old subject. I thought his chapters on the ethics of materialism and capital punishment are very needed today especially in the light of America 2017! Here he deals with capitalism and socialism, and also with the biblical view of property rights. On capital punishment Sproul shows that government must have some power of coercion over its subjects or else it will not be able to enforce the laws of the land. But this cannot be done properly without a belief that even government stands under the coercion of God as the Supreme Law-giver. The one disappointment is the chapter on abortion. I think I can assume that Sproul did not have the advantage of seeing where abortion would go since 1983. He calls early life in the womb “potential life” and says, “No teaching in the Old Testament or New Testament explicitly condemns or condones abortion.” Again, I think Sproul has probably changed his semantics since then. He does say that abortion is wrong and that the church should speak out against it.